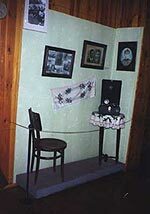 The collection of the Lodeinoe Polye Museum of Local History and Tradition amounting to 18 ths. items turns the pages of the town history, tells about the traditional culture and technologies of the 19-20th centuries and shows excellent pieces of local crafts. The town of Lodeinoe Pol'e was founded owing to the plan of Peter I to connect the northwestern regions of Russia with the newly born St.Petersburg. A shipyard was laid here on the bank of the Svir river to be gradually surrounded by the settlement. The name of the town (from "lodia" meaning a boat) reminds of the ship-building experience of the locals. The later railway communication development and building of the Nizhne-Svirskaya hydropower station - a GOELRO electrification plan firstling - turned Lodeinoe Pol'e into an important junction and industrial center of the region. The dramatic years of World War II are shown in the museum display with many relics and documents of the period. 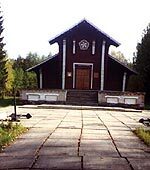 One of the most important lines of the Karelian front lay here along the Svir river, so the battles were bloody and fierce and the town was razed to the ground. Beginning from 1968, the Lodeinoe Pol'e Museum of Local History and Tradition is located in an exceptional building that housed the memorial collection of the "Svirskaya Victory" complex. The complex was arranged here soon after the defeat of the Germans and became a predecessor to the museum in its war display part. The museum section of traditional culture and crafts contains many wonderful objects, with the local 'Oyat' ceramics (pottery and toys) being of particular interest. Two Lodeinoe Pol'e residents highly deserve mentioning for their input in creation and running the museum. They are F.Teterin, the museum designer and a citizen of honour of the town and N.Trosheva, the museum director.